This post by MC Co-Director Joy Nolan has been adapted from a longer piece featured on Competency Works. * Assess several outcomes at once for a larger task/project (most common use we've seen so far). In this case, use the middle column for a short list of learning targets/outcomes that are in play for the assessment at hand. * Or, for a smaller, more focused task, the middle column can be used to list indicators/ criteria for a single outcome. Joy leads a session on student-centered feedback at MC's 2017 Summer Institute. You can use the single-point rubric to communicate about learning in these ways . . . .
as a reflection tool for individual learners after a project/assessment (also a great basis for preparing for a student-led parent/teacher conference). as a peer feedback tool for pairs or groups of students. You know how hard it is to get students to give each other positive feedback as well as criticisms? This rubric makes positive feedback half the exercise, by design. as a coaching tool for teachers and students to use together. If you have just a few precious minutes to give useful guidance to a student, this is the tool for you. It gets to the heart of the matter as efficiently as possible. as a learning and grading tool for students who struggle with reading/English. Because it is streamlined and contains a fraction of the text one sees in traditional rubrics, the language load is lighter, more useful and less overwhelming for students who don’t read easily. 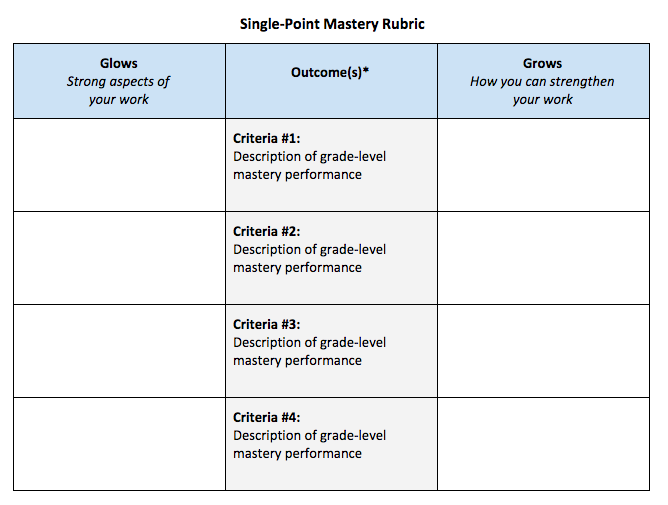 Want to read more about single-point rubrics? See the full piece here. Still have questions? Write to us at team@masterycollaborative.org, and your question could be featured in our Ask MC mastery advice column! The resource above is an adaptation of a rubric posted at www.cultofpedagogy.com—tweaked for competency-based/mastery-based use. Fluckiger, J. (2010). Single point rubric: A tool for responsible student self-assessment. Teacher Education Faculty Publications. Paper 5. Retrieved April 25, 2014 from http://digitalcommons.unomaha.edu/tedfacpub/5. Mertler, C. A. (2001). Designing scoring rubrics for your classroom. Practical Assessment, Research & Evaluation, 7(25). Retrieved April 30, 2014 from http://PAREonline.net/getvn.asp?v=7&n=25.